New research out of NYU Langone Medical Center could move the medical community one step closer toward effectively detecting concussion and quantifying its severity. Neuroscientists and concussion experts from NYU Langone and elsewhere, in a study published online last month in the Journal of Neurotrauma, presented a unique, simple and objective diagnostic tool for concussion that can be utilized in the emergency room or, one day, on the sidelines at sporting events. The study utilized a novel eye-tracking device to effectively measure the severity of concussion or brain injury in patients presenting to emergency departments following head trauma. The eyes have served as a window into the brain, with disconjugate eye movements — eyes rotating in opposite directions – considered a principal marker for head trauma as early as 3,500 years ago. Current estimates by optometrists suggest that up to 90 percent of patients with concussions or blast injuries exhibit dysfunction in their eye movements. Unfortunately, the “state-of-the-art” tool to detect eye conjugacy is asking a patient to follow along with a physician’s finger, according to Dr. Samadani, who also serves as co-director of the Steven & Alexandra Cohen Veterans Center for the Study of Post-Traumatic Stress and Traumatic Brain Injury at NYU Langone. 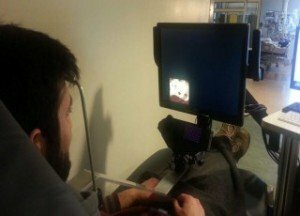 The eye-tracking technology used in this study was originally developed by Dr. Samadani and colleagues at the Cohen Veterans Center to assess eye movement in veterans of the long Middle East conflicts suspected of suffering from traumatic brain injury (TBI), concussion or other forms of brain injury. In this new study, researchers compared 64 healthy control subjects to 75 patients who had experienced trauma that brought them to the emergency department at Bellevue Hospital Center in New York City, with whom the NYU School of Medicine has an affiliation agreement. They tracked and compared the movements of patients’ pupils for over 200 seconds while watching a music video. All participants were between 18 and 60 years of age. The study showed that 13 trauma patients who had hit their heads and had CT scans showing new brain damage, as well as 39 trauma patients who had hit their heads and had normal CT scans, had significantly less ability to coordinate their eye movements than normal, uninjured control subjects. Twenty-three trauma subjects who had bodily or extremity injuries but did not require head CT scans had similar abilities to coordinate eye movements as normal uninjured controls. Among patients who had hit their heads and had normal CT scans, most were slightly worse at 1-2 weeks after the injury, and subsequently recovered about one month after the injury. Among all trauma patients, the severity of concussive symptoms correlated with severity of disconjugacy. This new study of non-military, civilian trauma patients visiting the emergency department builds on recent research conducted by Dr. Samadani, supported through the Cohen Veterans Center, which found that the use of this novel eye-tracking technology could reveal edema, or swelling, in the brain as a potential biomarker for assessing brain function and monitoring recovery in people with head injuries. That study, published Dec. 16 in Journal of Neurosurgery, looked exclusively at military veterans. Dr. Samadani’s future work aims to replicate eye-tracking’s diagnostic potential for head injuries on a larger scale in Iraq and Afghanistan veterans with post-concussive syndrome and post-blast military brain injury. Estimates from the Centers for Disease Control and Prevention state about 2.5 million U.S. emergency department visits were associated with traumatic brain injury in 2010, with rates increasing by about 70 percent over the previous decade. Currently there is no tool seen as a gold standard for diagnosing concussions, and imaging tests like CT-scans and MRIs are ineffective in the absence of structural damage to the brain.